Yesterday, I shared Pantone's Top 10 Colors for Spring, 2014. And what a bunch of beauties they chose! I shared some examples of these shades in action and we also talked about what colors they would pair up with best. But what was especially fun for me was getting to hear your responses and finding out which colors you were most drawn to. Now, you might find this odd but some of the responses didn't surprise me. You see, after blogging for almost 5 years you sort of get to know your reader's likes and dislikes. But regardless, I still was excited to see that some of my predictions rang true. Speaking of predictions... Do you think you could guess which colors I'm predicting will be hot for Spring? Sometimes I wonder if I'm all too transparent? Well, get excited because today I'm revealing my top 3 color picks for Spring! So without further ado, first up we have one of my favorite go-to color palettes. Shades of coral and peach. Perfectly romantic, a little spicy, and definitely eye catching, these are the sort of colors that always put me in a super good mood. And for that reason, they are one of my top picks. Now, this one probably doesn't come as a huge surprise to you. Because I think I've been pretty open about my love affair with all things mint! But in case you didn't know... Yes, mint has been at the top of my color favorites list for a while now. And truthfully, I don't see any signs of it dropping from my favorites list any time soon. I like it that much. Another color that has been on my favorites list for a while now is sunshine yellow. I guess you can say that when I fall in love, I fall hard. But seriously guys, what's not to love? I'd by lying if I said I wasn't totally drawn to bright pops of color. Especially when they are styled as pretty as this. I mean, just one look at this bridal party and I'm totally in color inspiration heaven. So there you have it! A quick glance at the top 3 colors that have stolen my heart and made their way into my top 3 for Spring, 2014. I mean, seriously. Can you imagine a coral, mint and yellow wedding? Now, that would be something I'd love to see. Oh, and in case you're wondering...Yes, you can totally pair any of these shades with one another. Mint and yellow? Totally works! Coral and mint? Such a great look! Yellow and Coral? Yes, please! And yes, these three shades were on Pantone's Top 10 list for Spring as well, so it seems as if we are sort of in sync when it comes color trends! So tell me... what color palettes are you finding irresistible here lately? I can't wait to hear all about them! 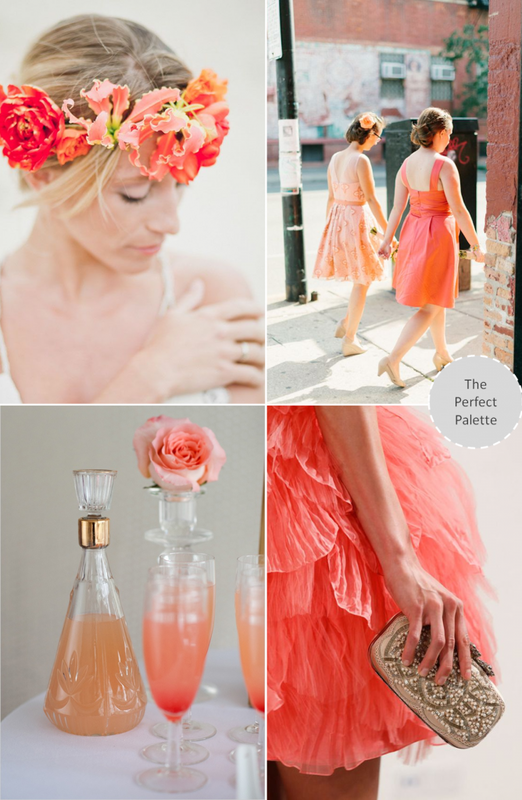 12 Comments " Top 3 Hottest Colors for Spring 2014 Weddings "
How pretty! Coral really is able to brighten a mood isn't it? In fact all 3 are really uplifting colors! These are all gorgeous colors so I think you have some great picks! love this to the moon and back. your picks are spot on! Great picks. I'm especially liking the mint. Coral next and then yellow. All very pretty, especially loving the coral! Love, love, love the shades of coral! Of course coral and mint has been one of my favorite combos for a long time! LOVE these. I can't decide. I'm thinking the minty one takes the cake though! So excited that these are the picks. Love them all! I can't wait to see more of these colors! Thanks for this sites the colors are amazing. I loved weddings. I really do. For me weddings are magical and it should be shared with your friends and loved ones. I know a site where you can plan and share your wedding moments.